Yes, it’s been a hard season so far. Lotsa water has encouraged fungal diseases and blight among other things. But it seems churlish to complain since we’re often faced with drought, so given a choice, I’ll take this summer over a lot of others we’ve gardened through. Even though it’s been difficult, I’ve got a semi-steady supply of tomatoes coming in to deal with. More paste varieties than slicers, which was a conscious choice when I started my seeds. I love fresh tomatoes, but I count on having a bunch in jars in the larder for winter. 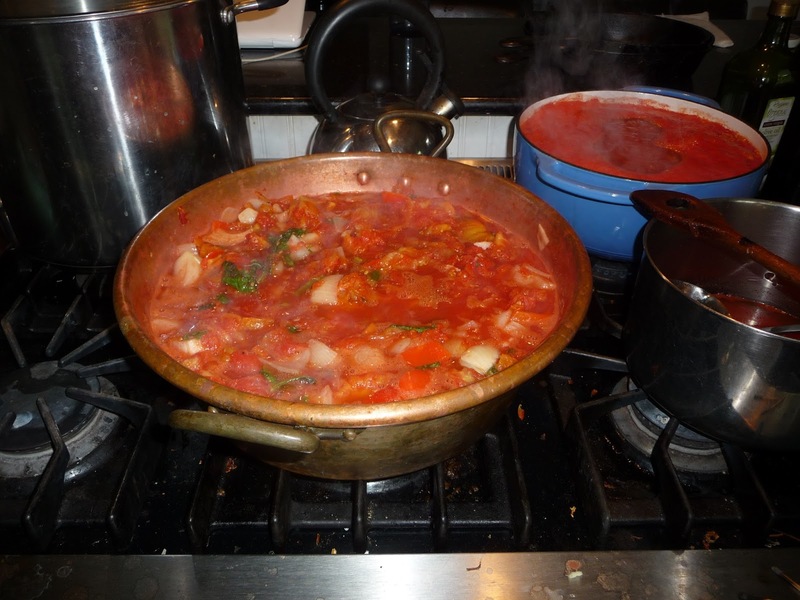 In addition to plain canned tomatoes, which go into casseroles and soups, I make salsa, spaghetti sauce, and spicy tomato bullion for a brothy winter pick-me-up. I’ve always planted Big Mama paste tomatoes since discovering that variety a decade or more ago (hard to tell, life flies by so fast; it might even have been two decades ago). They are reliable producers, even when hit with early blight, and are a dream to work with in the kitchen, whether it’s stuffing them peeled, halved and raw into a canning jar or peeling and rough-chopping them for sauce, bullion or salsa. This year, I tried a new paste variety, ‘Supersauce’ touted as the largest paste tomato ever. I believe it now that I’ve seen it. They are HUGE. And meaty. Even more so than Big Mamas. Interestingly, though, the plants do not seem to be as hardy as the Big Mamas, and they don’t seem to produce as many fruits. (I expect the hybridizers will improve on them as the years go by). Additionally, they are a little tricky to handle when everything’s wet and juicy, as it is when you’re peeling and chopping. The Supersauce are large enough that I sometimes lose my grip on them; it’s like trying to holding onto a wet bar of soap. Some days, I could probably be on America’s Funniest Home Videos if there were anyone around with a camera in hand. On the upside, Supersauces are delicious and even more meaty than Big Mamas, and once peeled, make great everything, including tomato juice. Canning tomatoes, no matter what you’re making, always produces juice. To keep the jarred tomatoes or sauce from being too running, I put peeled the chopped tomatoes into a bowl, then before putting them raw into sterilized jars, or throwing them into the confiture, a big French kettle designed for making jam in which I make salsa and sauce, I squeeze the fresh juice from them into a bowl. The juice goes into a second pot and is simmer with veggies –a little cabbage, a carrot, sweet pepper, slice of beet, garlic, onion, celery leaves, maybe a hot pepper, and whatever other veg comes to hand [it doesn’t take much]. When the veggies are all limp and they’ve rendered their goodness intot he tomato juice, I strain it, pour it into sterilized jars and process that. It’s all work, but it’s also very satisfying. Especially in the dead of winter. Sliced tomatoes about 1/4 inch thick and lay on a baking sheet with sides so the juice doesn’t run onto the oven. Sprinkle with a little salt, a little olive oil and dot with some fresh garlic then roast in a slow over for about 2 1/2 hours. Cool. Layer in a container. Sprinkle each layer as you go with a little white wine vinegar or white balsamic, cover and keep in the frig for a week or more. For lunch or supper (or a great filling snack) spread a little goat cheese on some toast, lay a few roasted tomatoes on top, hit it with a little grind of black pepper. As Homer Simpson would say: Ummmmmm! Mm, Nancy – all looks delicious. I've had the opposite experience with the sauce tomato plants you gave me, or rather about the same with the Supersauce (and wow, they are big) whereas the Big Mama gave up and died of early blight after producing one tomato, and I've pulled it out. Oh well. I plan to do my own tomato report after I've checked on the plants at the demo garden. Loved your report on Big Mama v. Super Sauce. A couple of Howard County MGs are running a test using productivity and taste. Would be interested in hearing your opinion on how you find Big Mamas stack up against Super Sauce. Sorry to Big Mamas didn't work out for you, Erica. Interesting that your growing/cultural experience with the two varieties was essentially opposite to mine. There are so many variables in this game. I have three grafted tomato plants I've been trialling this summer. Put two –a costoluto genovese and a heatwave — side by side in one section of the garden and neither are happy campers — blight a problem, fruit attacked on several different fronts, while the Heatwave that I put in the same spot with the Supersauce and a couple others, both heirloom and hybrid, are essentially fine. soil? air flow? drainage? critter populations? All or some of the above? I just know that that particular spot in the garden will get some attention with more compost (in addition to what we already put on this year), and a few other things, and then plant something different there next year. It's a p-erpetual learning curve. Thanks, Kent. So far, I've not found much difference in taste between the two, tho I have not eaten either raw. I had both (each) roasted on tast for supper last night and had I closed my eyes, could not have told you which was which. I'm looking forward to hearing from Jon how the Iron Lady tastes! I got Iron Lady plants from Jon as well, and they are producing well with less blight than the other plants, but slooowww to ripen. My husband ate one the other day and said it had an average tomato flavor, for whatever that's worth – didn't knock his socks off, I guess, but OK. I'm waiting for another one to get fully red so I can try. I am trying the Big Mama's for the first time this year and I cannot decide whether they will make a comeback or not. 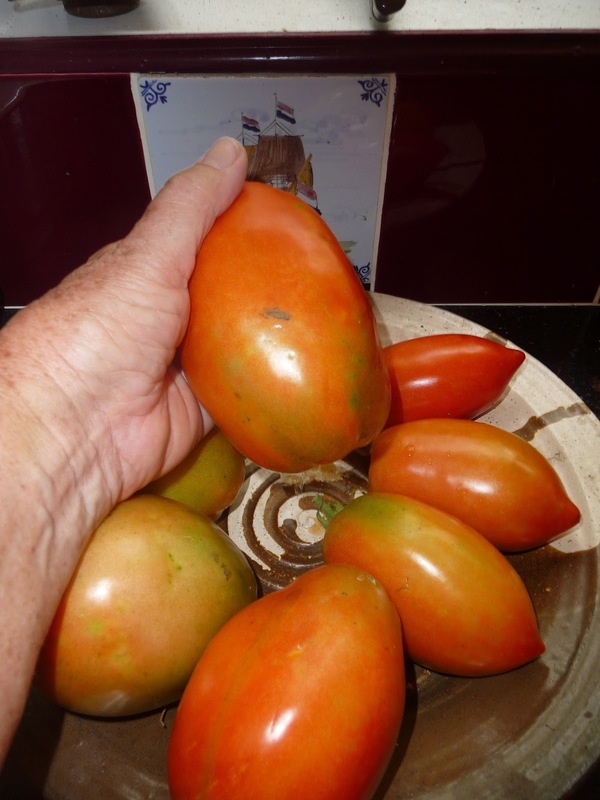 Yes, they produce enormous quantities of large tomatoes and they got very little blossom end rot which is very impressive considering this summers abundance of rain. But my heavens, are they ever susceptible to early blight!!! The one is my garden is still doing okay, although it has made a very unhappy camper out of the Celebrity that is standing right next to it. The Big Mama's in the school gardens are pitiful specimens because of the early blight. At this point more stems than leaves. Plus they have infected almost all the other plants. It also seems that the stinkbugs seem to gravitate towards Big Mama's. As for taste, so far nothing to write home about. I am growing another, rather large, paste tomato: Gilberti (it did make a comeback after last year!). 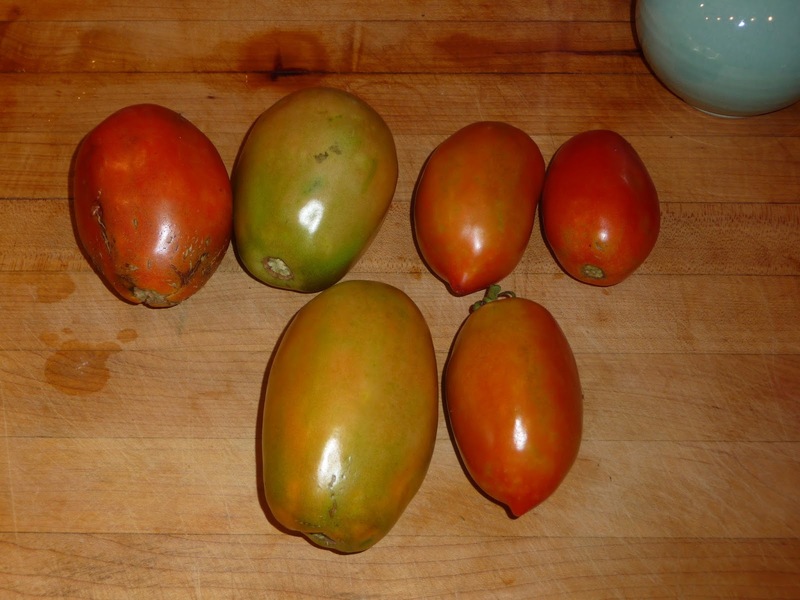 It does get horrible blossom end rot, the tomatoes are slow to start and to ripen, but they are big and they taste great. Not a sign of disease either! Like I said, it is a very slow starter but last year it finished strong! When everything else was basically done, Gilberti was still cranking them out, well into October. This plant becomes an enormous jungle. It goes where it wants to go and it is really hard to keep in check. Small price to pay for great tomatoes at the end of the season. On the menu for tonight: roasted tomatoes (both Gilberti and Big Mama) with goat cheese and some honey. We will see if there is a taste difference. BTW, the little cousin of both of these, Juliet, is a trooper. Maybe my all time favorite. No disease, no cracking, no blossom end rot and fantastic taste. Most other tomatoes have taste rather “watered down” this season. But not Juliet: she is as sweet as ever. It just goes to show, Sabine, that it's so variable, including our response to taste. I think Juliet is fairly tasteless, at least the few I've tried, tho they cook up nicely. Tried a raw Supersauce this morning as I was putting it into a pot of vegetable soup for supper (i hate cooking in the evening, and try to make whatever I'm going to have while I'm making coffee and feeding the dog), and it was good — not ab fab raw, as you'd expect with a paste type, but good and it is delicious roasted with garlic and marinated. I'm interested in the very different experience (from mine, at least) you seem to have had with the Big Mama plants. I wonder what decides it a combination of factors, or a single thing…? Hi Kent, would obviously love to hear the result of your test, especially when it comes to disease resistance and taste! Isn't it fascinating? Especially since we are in the same county. I love comparing notes and running experiments. As you know, I grow all my tomatoes from seed and then I plant them out, usually in the same week, in both my own garden and the school gardens. Makes for some great comparison. BTW, what is a “slow oven” in the Robson household? I did roast some Gilberti's and Big Mama's a few nights ago (don't think my oven was slow enough). They were delicious, although the Gilberti's were sweeter! At the end of the roasting, I put goat cheese and a tiny bit of honey on top of the tomatoes. That goes back into the oven (slightly higher temp) for just a few minutes. Delicious!!! Slow oven here is about 275F. Honey and goat cheese toasted on top sounds fabulous. I'll have to try it. And I'll have to try GIlberti's — where do you get the seed? Interestingly, a friend about 5 miles north of us said the Big Mamas I gave her are doing better than the Supersauce. I live just a bit north of most of you (Westminster) and must annually endure RADAR images showing fronts bringing rain from the West that break into two or more pieces west of Carroll – or even west of Frederick – so that any precipitation passes to our North or South. This spring's uncharacteristic water supply was a real blessing to our tomato crops! (Not to our beans, however which rotted repeatedly in the cool weather.) However, the last rainfall here fell a month ago and was less than 1″. About four years ago I did construct a twin rain barrel system that collects from three roofs. It even accumulates dew when there is some. However with absolutely no rain, it cannot make a significant contribution. Oh well! We've grown and preserved several quarts of tomatoes so far this season. To keep plants alive, I partly fill the barrels from City supply and allow it to warm for a while before I apply it to the tomatoes.